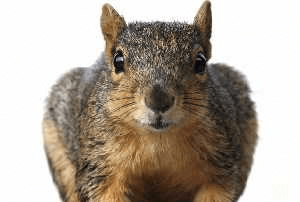 Trapper Jack is a local, full service Wildlife Removal, Wildlife Prevention and Wildlife Damage Repair Company specializing in Squirrel Trapping and Removal. We Offer Free Estimates and 100% Satisfaction Guaranteed. Squirrels and Flying Squirrels are usually classified as a pest species due to their habits of living in houses. For these reasons, many people wish to have this nuisance animal trapped and removed. (Sciurus carolinensis) Squirrels are usually gray, sometimes red, brown, or black. Adults average about one pound in weight. They can supposedly live for up to ten years, but life expectancy in the wild probably isn't more than 3-4 years. Squirrels give birth to two litters per year - one in late summer, and one in winter. The female gives birth to 3-4 young after a 44 day gestation, and the young grow quickly, and are weaned in about ten weeks. Squirrels are most active in morning and evening. Squirrels eat mostly nuts and seeds. They live in a variety of habitats, both forest and suburban or city areas. They establish home territories, and often communicate via scent, chattering, and flickering of the fluffy tail. Squirrels love to live in attics. They also love to chew, and will chew on houses or wires, ducts, pipes once inside an attic. People don't like the noises of squirrels running about above the ceiling or in the eaves, but it's really the chewing that's a problem. If squirrels chew on electrical wires in an attic, it can create a real potential fire hazard. Squirrels also bring in nesting material and leave urine and feces in an attic. No real important diseases, though they do carry parasites, and thus are vectors for the diseases that fleas, ticks, etc. can transmit. They also leave a lot of droppings, which pose the usual excrement health risks, such as leptospirosis or Salmonella. HOW DO I GET RID OF SQUIRRELS? If it's just squirrels on the property, the best bet is trapping and removal. If it's squirrels in the attic, then all of the open holes and vulnerable areas through which they can enter should be sealed shut with a material that squirrels can't chew through, such as steel. The squirrels can then be trapped and removed, or excluded through the use of one-way exclusion doors and tunnels. CAN'T I JUST USE A REPELLENT? There is no registered or effective squirrel repellent available. You can find some products on the market, such as mothball-based or urine-based repellents, but they are bogus. Go ahead and try them. And those high-pitch noisemakers? The FTC has issued a warning against them - ultrasonic sound emitters do not work. Some people put noisy radios or strobe lights in the attic, but these also prove ineffective. There is no quick and easy fix when it comes to squirrel removal and control. It's best to have a professional trap and remove the animals properly.